This lovely little house belongs to my in-laws. If you look closely, you can see an enormous Holly tree in their back yard, peeking (well, maybe towering) above the roof. We spent T-giving with my in-laws. We drove down to Marietta, OH on Wednesday, cooked all morning Thursday (yay - I love doing the Turkey and stuffing!) and had great food (if I do say so myself). We had fun with some games of "name the best . . ." which we love to play, and we played dominoes and Shanghai Rummy. 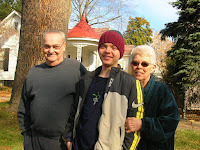 Simon is now taller than both of his paternal grandparents - and he loves it! 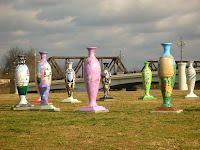 These vases are in Zanesville, OH, and it was a surprise find for us. I love it when you see something lovely and new on a "old" path. Then we drove home on Friday. I had to work yesterday, but I got to slip out a smidge early so we could catch dinner before going to see Christmas Carol last night with our friend, Jeri K. Fun weekend! Today is a "clean, launder, organize, grow-up and pay bills" day. 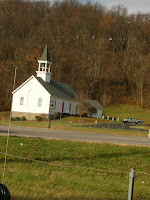 This little church was on our route home, and I've always loved little wooden churches in the country. I took this from the parking lot of the gas station. Glamorous, huh? Sounds like your family had a nice Thanksgiving! At my parent's house, Shanghai Rummy is a big deal. I love card games. Michael not so much--which stinks. Hope you continue to have a great start to the holiday season! Adorable little house! Looks like it should be a gnome home tucked back into the woods. Sounds like a wonderful visit. I love their house! I always wanted a house that had something like that porch--a porch, a window seat, a turret--something that would look a little different, but cute. 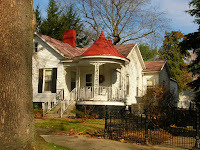 The red roof is wonderful and I love that it's pointed above the porch. Sounds like Thanksgiving was fun. Jeeps! I think of Simon as this little toddler. Probably because he was a toddler the last time I saw him. 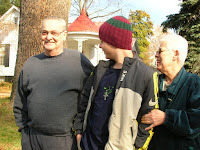 Will it make you shudder to know that my oldest in is college? what a cute little house! it looks some cozy and has so much character. and i love stumbling across the unexpected to, so those vases are great. Marietta is a beautiful little town, full of Victorian homes. The houses on either side of theirs are both HUGE, and both really beautiful, too. Cat, your pictures are great! The house is lovely. I just noticed those in Zanesville over the weekend too!